Inspired by the interplay of light and shadow, he is able to manipulate and maximize both for dramatic effect. Fascinated by the subtleties of texture and tone, he is an expert in capturing the finest details of surface and shade. Intrigued by the inherent nuances of personality and emotion, he is patient enough to wait for the perfect, spontaneous moment. He is photographer and artist Ed Rode. "Willie Nelson had gotten rid of his tuxedo jacket by the time he returned to his tour bus following a TV taping during the late ‘90s. The key moment came after I asked him to name a few of his favorite songs. This image of Nelson cradling the Martin classical guitar he calls Trigger was used as the cover shot of the 2003 album, Crazy: The Demo Sessions, a collection of his earliest recordings in Nashville." 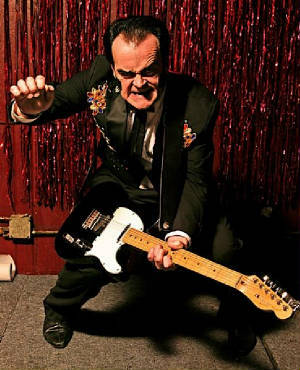 Cult musical artist "Unknown Hinson" strikes a pose in a late night bar after a performance. Know for his incredible guitar playing he performs his campy rock and roll music in clubs all over the southeast. His eye on a friend shooting photos, Ed Rode, the high school kid, picked up his dad’s camera. He shot a few, too. He shot a few more. And more still, lens clicking open and shut, capturing frame after frame of images. He kept one foot in the newspaper door for many years to come, camera in hand. In 1990, Ed left Michigan to travel south, drawn to Nashville, Tennessee, and he took a job there for a paper. Three years in a row, he was named “photographer of the year.” He was onto something. 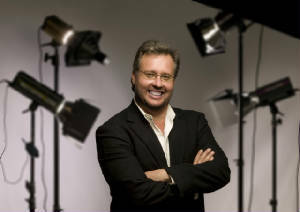 For two years, he served as chief photographer and photo editor for the Sports Nashville magazine. In 1995, he cut the rope and went full-time freelance, opening his own studio. Ed was learning Nashville and Nashville was catching Ed’s eye … and ear. He realized that he was living in the belly of the country’s songwriting capital. Music wasn’t just for the ear. His photographer’s eye was trained to see music in images. If you took a photo just so, you could hear it start to hum. You could, if you waited long enough, if you watched for it carefully enough, snap that moment when a man’s soul started to sing, regardless of the instrument in his hands. In these moments Ed found his own note. Rare is the celebrity face in Nashville he hasn’t captured on film. His masterpiece is a 15-year project to document the great songwriters and musicians of Nashville … and his lens is still clicking away. The project is called, simply, “Songwriters and Musicians.” The count is at 175 musical faces, and still counting. His favorite is probably the photo of Willie Nelson. Hanging out with Willie, he knew enough not to dictate the moment. He just hung out, camera in hand, listening to the man strum his guitar, snapping now and then. 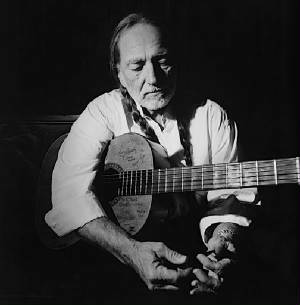 When he asked Willie about what he was writing now, the musician’s face turned to dream, fell into introspection, considering his own art. Ed snapped the photo—and felt it. A new venture is Ed’s painting. He builds paint onto his photographs, layers upon layers, slabs of bright, raw color, letting instinct guide him, just like when he is snapping photos. It’s all about letting the emotion run from your heart to your eye to your hand. Color and emotion, it’s almost one and the same thing to him. Asked about the role of technology in photo art, Ed Rode admits it has been a freeing thing. Digital has finally outdone the lab. There are new horizons to explore. New magic to master. He loves to push himself to places he hasn’t yet been, whether it is with a lens or a paintbrush in hand. Sure, he says, such fine technology can let anyone take a good photo. But then he laughs, and there’s music in his laughter. 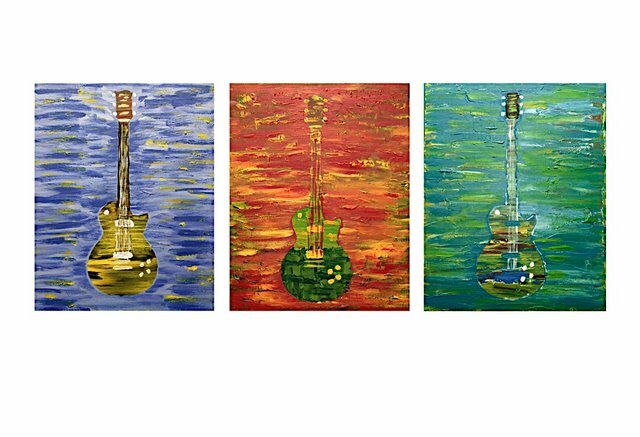 "This triptych is of several of my guitar paintings. They are done with acrylic on canvas. I really love the emotion the colors convey. This piece came together almost as an accident again as several of my friends (including my sister Jenny) suggested I put a few of my guitars together as one piece of art. This has worked well and I have printed a few of these as an limited edition piece on canvas." Ed Rode's work is featured throughout the summer issue.